With speeds that surpass many monochrome lasers, the Xerox Phaser 6350 has color speeds up to 36 ppm, and can produce photo-quality prints at 1,200 x 1,200 dpi. If that isn’t enough, you can add options to the base model to increase it’s usefulness for any medium size business or small publishing office without having to buy a new printer. Normally color printers have two speed specifications: one for B&W printing and one for color printing, and usually the B&W printing is not as fast on a color laser printer as with a monochrome-only laser. By using a single-pass color print design, the Phaser 6350 can print up to 36 single-sided pages per minute, be they B&W or color. Even printing in duplex mode at 18 ppm the Phaser’s speed is still impressive. The Phaser 6350 gives two high resolutions: you have a choice of 1,200 x 1,200 dpi and 2,400 x 600 dip, for optimum photo quality or sharp text and fine graphics. For offices that go through a lot of paper, the 6350 comes stock with a 550-sheet cassette tray that supports up to legal-size (8.5” x 14”) paper. That means you can drop an entire ream of paper into the tray easily and with no fuss. A front panel hides a 150-sheet multi-purpose flip tray for labels, post cards, envelopes, 3” x 5” postcards, paper bond weights up to 60 lb, and transparencies (Note: There is a difference in transparency film for color lasers versus the stuff used for monochrome-only lasers.). For even more paper-packing capacity, a second 550-sheet tray can be attached. Having built-in Ethernet network support and hi-speed USB, this printer will be right at home either in the middle of an office floor or directly connected to a secretary’s computer. Without adding more RAM, the expandable 256MB of printer memory can handle a good number of volume printing and large graphic files. 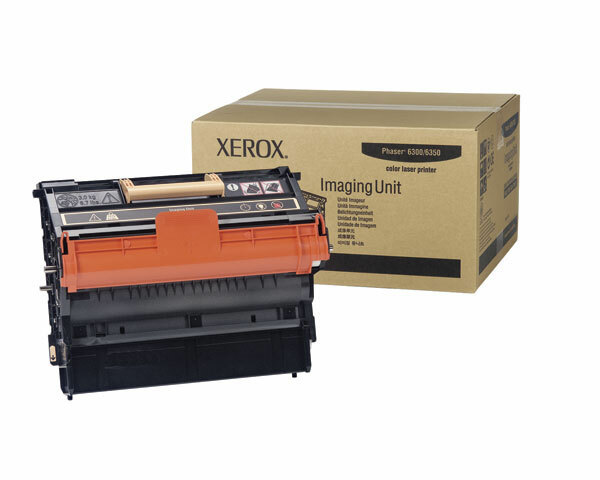 Understanding the printing needs of today’s businesses in providing support for the major software applications, Xerox has included the popular HP PCL5c and Adobe PostScript3 print emulators to satisfy the most diverse office demands. For color matching in publication, the Phaser 6350 can be set for Apple ColorSync, CIE, PANTONE, and Adobe PostScript color standards. The intuitive control panel on the Phaser 6350 has a 6-line animated LCD Display that defaults to show the most important thing: toner levels. The buttons are set up and arranged to make understanding what each one does pretty intuitive. The control panel, printer information, configuration, errors, and network settings can be performed directly through this control panel or by using Xerox’s CentreWare IS web application. 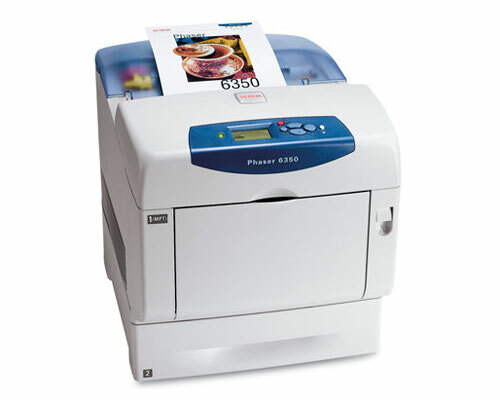 The Phaser 6350 is available in two more models: the 6350DT which comes standard with a second 550-sheet tray and an additional 256MB of RAM, and the 6350DX which has all the features of its siblings plus a 1,100-sheet wheeled paper tray platform, and a 20GB hard drive. All of the extra features are also available for the base model 6350DP as options. The printer produces up to 55B of sound printing, and idles at 35B. To give you an idea of what that means: 60 decibels is the level of normal conversations and 30 decibels is the level of a quiet room. It’s a little loud to be sitting next to your desk, but will blend in with surrounding background noises if put in the middle of an office or copy room. 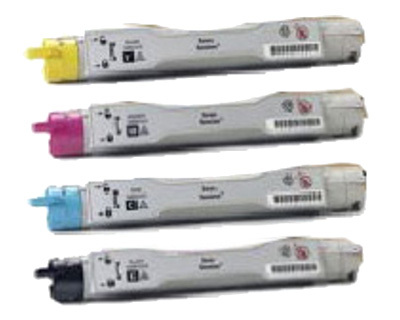 Review it: "Xerox Phaser 6350 "
Xerox provides you will full standard-yield toner for all four colors. The amount in the 6350’s regular toner has more capacity than high-yield toners for other color laser printers. Each cartridge is good for 4,000 pages (at 5% coverage). High-yield cartridges offer 10,000 page printing capacities. Toner combo-packages are available to save on costs.